Releasing alongside Pharrell’s adidas NMD Hu Collection will be this adidas NMD R1 Foot Locker Eu Exclusive set for Thursday, September 29th. Foot Locker Europe and adidas Originals has announced that they will be debuting another exclusive adidas NMD. This release features a breathable mesh upper dressed in Black, with tonal Three Stripes branding and back heel counter. 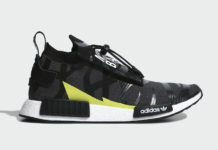 The heel tab reads “The Brand With The Three Stripes” and is completed with a White Boost midsole. Check out the additional images below and look for this adidas NMD to release exclusively at Foot Locker Europe on Thursday, September 29th.